IGEMS incorporates all of the data and functionality contained in NHSS, it also provides added information including hurricane tracks and current wind conditions. Since IGEMS utilizes the latest software and technology it provides a richer functionality, including a locate ability, and a richer user experience that supports mobile devices like tablets. 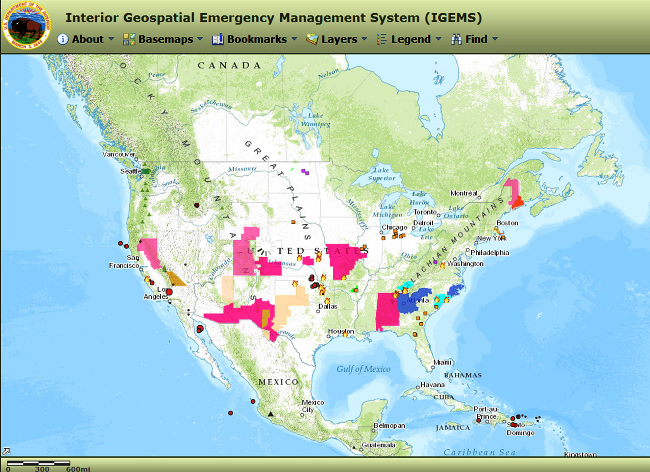 Consequently, IGEMS shows the potential for major natural disaster events: wildfires; earthquakes; wind, gale, flood, red flag, and other weather warnings; hurricanes; and volcanoes in a format suitable for mobile devices. Users can also view tide monitoring stations, current weather radar, and wind direction and strength, and select topographic, street map, or satellite imagery backgrounds. Comment: As one of the web's first natural disaster viewers when it was released in 2003, NHSS had been in need of rebuild for the past several years. Kudos to DOI!